The proposed development site is a former landfill on Waterside Drive in Walton on Thames. Elmbridge Borough Council proposed developing the existing land to provide a Sports Hub, consisting of football and athletics facilities. Site investigation undertaken by Leap Environmental recorded that the underlying soils were contaminated with asbestos, polycyclic aromatic hydrocarbons, total petroleum hydrocarbons with hotspots of lead and BTEX compounds. Groundwater analysis indicated widespread contamination within the landfill mass, the principal contaminants detected were arsenic, boron, polycyclic aromatic hydrocarbons and total petroleum hydrocarbons, benzene, phenolic compounds and other semi volatile organic compounds (sVOCs). A Remediation Options Appraisal of Best Available Technologies was undertaken by Leap Environmental to address to the identified risks. This appraisal identified the requirement for Permeable Reactive Barrier between the Source (landfill) and the identified receptor (River Thames) to address the identified pathway. Wilmott Dixon commissioned Envirotreat to design, gain regulatory approval and install a Permeable Reactive Barrie to address the risk identified by Leap Environmental and the Environment Agency. The Environment Agency requested the requirement for treatability trials to be undertaken to demonstrate the efficacy of the proposed strategy in accordance with the Environment Agency 2002 “Guidance on the use of permeable reactive barriers for remediating contaminated groundwater”. 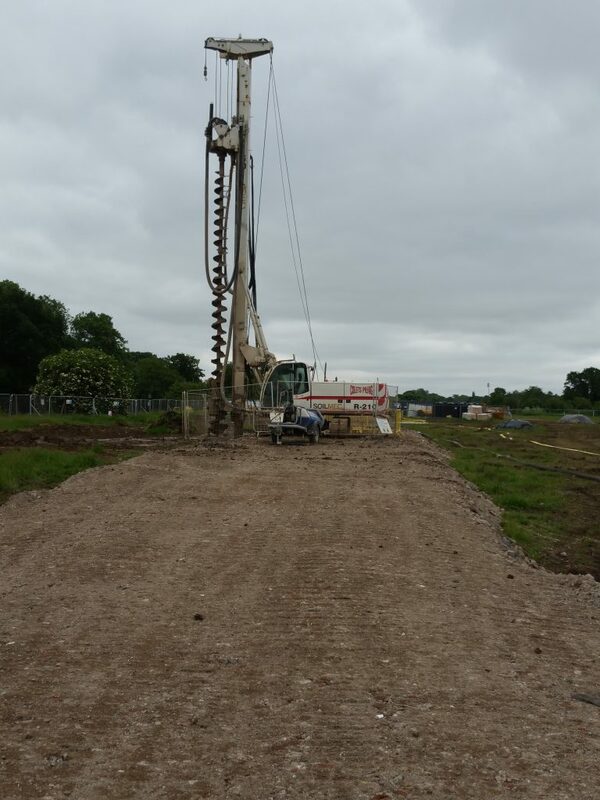 Following satisfactory approval of the E-Clay Permeable Reactive Barrier design and proposed Remediation Method Statement, Envirotreat installed the 410m barrier using a continuous flight auger to achieve the soil mixing to the required depth of between 7m to 10m bgl.